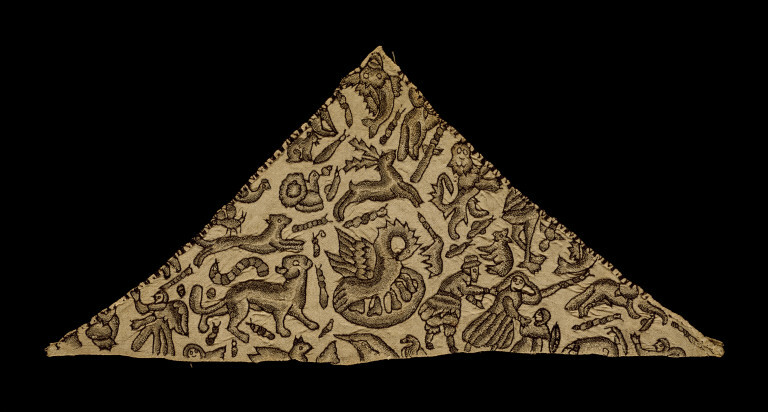 The effect of blackwork is cleverly achieved in this forehead cloth from about 1625-1650. Instead of using a single colour of silk thread on linen, two threads of mixed white linen and black silk thread are used. These are embroidered in satin stitch and give the effect of speckling found in blackwork. The central motif, the Pelican in her Piety, was a motif taken from emblem books. These were a popular type of literature in the 16th and 17th centuries, which associated pictures and symbols with mottos and moral poems. The Pelican in her Piety relates to a myth about a pelican feeding her young from the blood of her breast when she could find no food for them. This myth and images of it were associated with Christianity from the 2nd century AD and they figure frequently in emblem books. 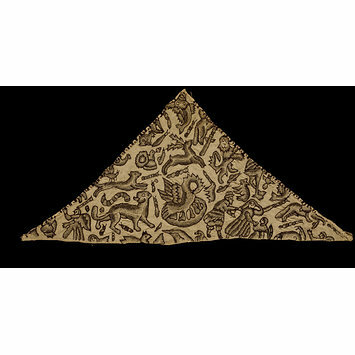 By the 1620s, the Pelican in her Piety appears in embroidery pattern books along with the other motifs - animals, insects, fish and human figures - seen on this forehead cloth. Given the lively and naive mixture of images in the design, it is hard to tell if the Pelican was chosen for its symbolism. A linen forehead cloth embroidered with black silk thread in stem stitch, and two threads of white linen and black silk (one predominantly white, the other predominantly black) in satin stitch. 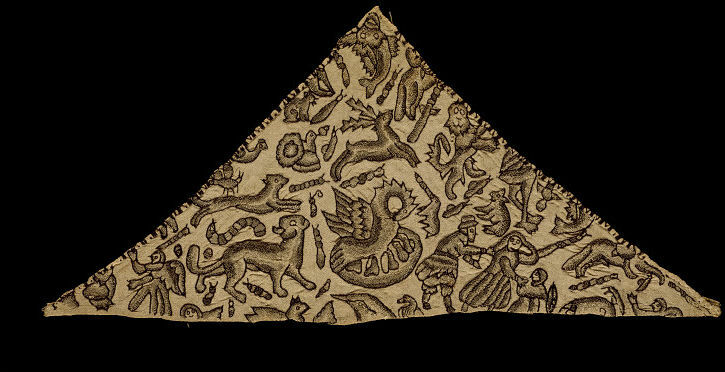 The pattern consists of individual motifs of the Pelican in her Piety, a narwhal, lion, leopard, stag, dolphin, an angel, figures of a man, woman and child, snails and caterpillars. The motifs are outlined in black silk, then filled around the edge with the predominantly black silk/linen thread, then closer to the centre with the predominantly white silk/linen thread, to give the effect of blackwork speckling. The forehead cloth is unlined and embroidered around the edge in black silk thread in buttonhole stitch. The thread count is 50 x 55 threads per inch, approximately.